If you have been looking for a room with a view including elegant design and relaxation like walking along the seaside then take a look at this Special Edition Tommy Bahama Relax Edition 19CB travel trailer by Airstream RV. It features a booth dinette that you can enjoy your meals at or transform into an extra sleeping space. You can jam out to music with the satellite radio with Bluetooth while enjoying the outdoors underneath the power patio awning with LED dimmable lights. When you're ready to hit the sack, you can jump into the pillow top memory foam mattress and enjoy a good night's rest! 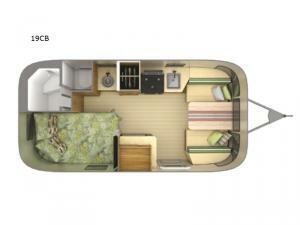 In any Special Edition Tommy Bahama Relax Edition travel trailers by Airstream RV you will enjoy the surf shack you've always wanted combined with the comfort, quality, and style that you deserve. Their decor and accessories encamp the breezy feeling of island living with Egyptian cotton bed sheets, Ultraleather® and Tommy Bahama® lounge and dinette seating, a stainless steel Kohler sink, Oceanair wood blinds, a smart Blu-Ray DVD player, and a complimentary Tommy Bahama cooler, chairs, and Marlin mug set! These units are constructed with a fluorocarbon treated UV protected aluminum exterior, tempered tinted windows with a double cam latching system, Nev-R-Adjust® brakes, a shock absorber, and a torsion axle suspension, giving you a travel trailer that is built to withstand your amazing adventures!